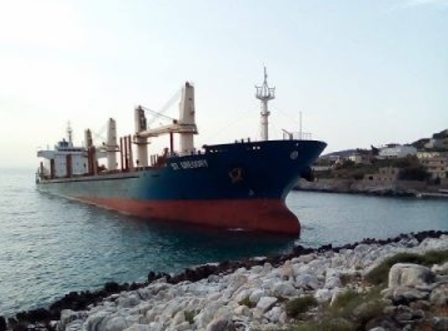 On the morning of June 7, on the southeastern coast of the Peloponnese, Greece, the bulk carrier St. Gregory, the Bahamas, ran aground. According to the Coast Guard of Greece, the ship, at the time of the accident there were 19 crew members, none of whom were injured as a result of this incident. The Coast Guard added that there was also no contamination of the water area. The divers inspected the ship, discovering damage to the ship's hull, as well as a partial loss of tightness. The incident occurred on the route from Istanbul, Turkey to Sfax, Tunisia. At the time of midnight on the 8th of June the vessel still remains at the crash site. The Greek Coast Guard also reported that the cargo on board St. Gregory - 31,000 metric tons of sulfur.